Ready for a geography project with the kids? This is a world map by UK artist Susan Stockwell for Bedfordshire University’s Luton Campus. 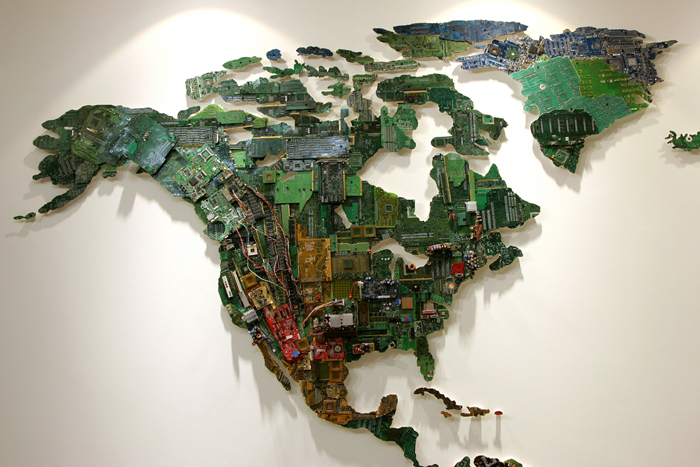 She used recycled computer components to create it. Americans are notoriously BAD at geography and map making is a great way to help kids learn what’s where on planet earth. It doesn’t have to be perfect, but some concern for scale should be part of the process. Let your kids use old Legos or other plastic toys and glue them onto a piece of masonite board. If you have the skills and the tools you can cut the masonite to form the major land mass and attach all of the smaller pieces with wire. If not, just use the masonite as a big rectangle and glue everything onto it. Raid your recycle bin for colored plastic caps and any small metal debris you can glue or screw onto the masonite. Old washers, screws, a portion cut from a worn out tape measure, whatever is in those little tiny drawers of Dad’s tool box. Yeah, the one he never opens. Make it a treasure hunt first and an art project second. Now you have a good use for that broken piece of train track at the bottom of the toy chest! Take $5.00 and head to OSH with the kids to peruse the aisles looking for funky hardware, bits of wire, and metal for your masterpiece. I promise you this is the kind of family experience they’ll remember all their lives. I haven’t done this yet myself, but I’m inspired to try. If you’ve done something like this I’d love to hear any tips or tricks you discovered. Sweet. Awesome homeschooling project!!! What an awesome idea!! show us how it looks!! !